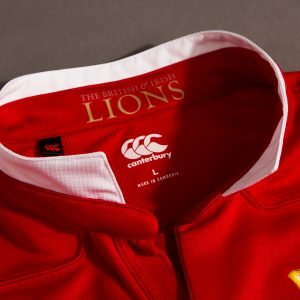 It has been dubbed the Untouchable Shirt but what is so important about the new 2017 British and Irish Lions Shirt by Canterbury. Heritage has been key to the whole range that Canterbury have produced for the Lions starting with the Launch release of the Limited Edition Heritage Shirt last November to the whole ‘Since 1888’ range which showcased the whole history of the Lions shirts. 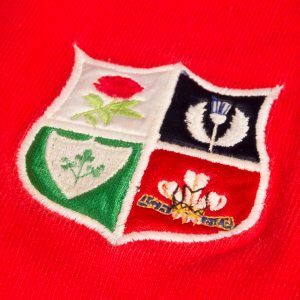 The Lions Shirt didn’t start as the iconic red shirt that is easily recognisable to everyone today, the block Red was adopted for the 1950 tour. The first tour organiser Arthur Shrewsbury asked that the shirts “would be good material and yet take them by storm out there” so for the first tour to Australia and New Zealand the kit comprised of a Jersey in hoops in Red and Blue on a White background paired with white shorts and dark socks. This was also the kit for the 1891 Tour. 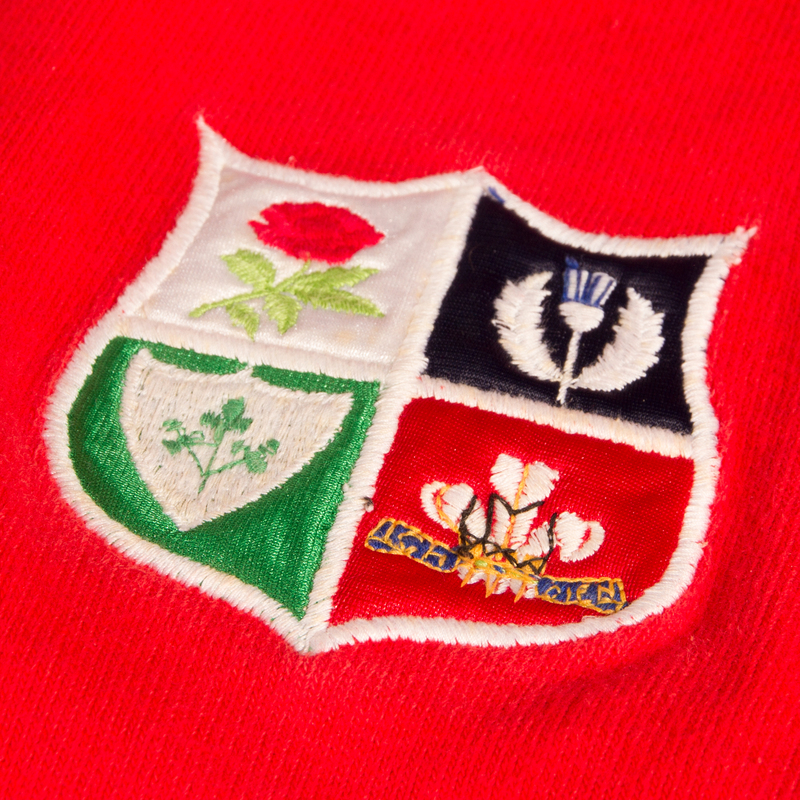 The Shaw and Shrewsbury Team as they were then known let the design of hooped shirts reigned with slight variations until the 1908 Tour which was a Red jersey with a white chest band; the Blue was dropped from the design as the Scottish and Irish Unions refused to take part in the Tour that year. Blue however did feature in the socks like it had done in all previous versions of the kit. 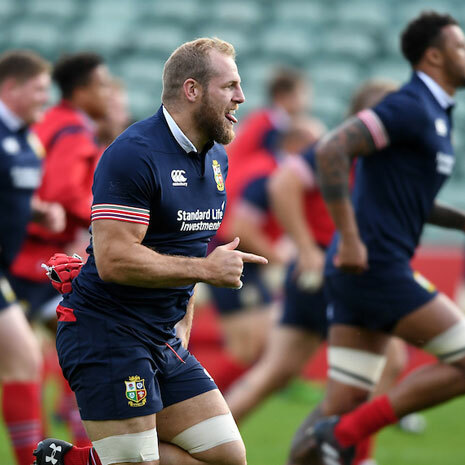 1910 Tour to South Africa saw again a change for the Lions, with the return of the Scots to the Lions side in came the Blue Jersey paired with White shorts and Red socks. This was also the first of Shirts to actually be marked with the Lion- Rampant Crest. When they returned to tour South Africa in 1924 this is when they were officially first referred to as the Lions, this was a bit ironic though as on the Blue shirt the Lion was replaced that year with the quartered crest representing the four home nations that is still used on the shirts today. There was a change in crest again in the 1930 as the name “The Lions” had become central to the teams and tours. 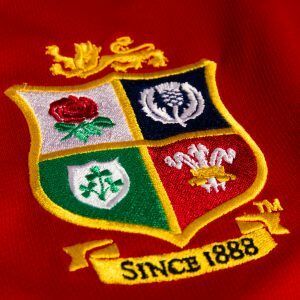 So it marked the return of the Lion by having three heraldic style lions as its crest instead. 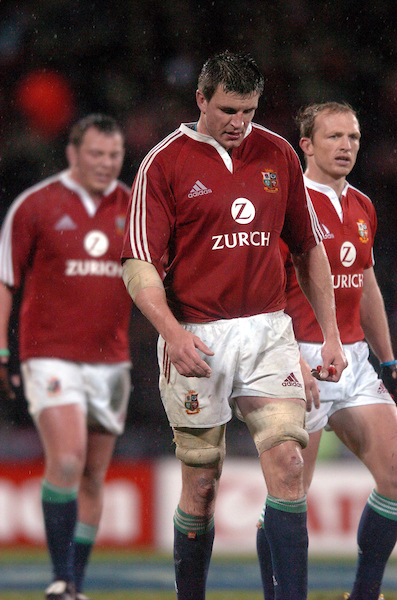 The 1930 Tour also dealt with Irish displeasure of not being fairly represented as part of the colours on the kit alongside the other nations this led to the flash of green being included in the Socks. 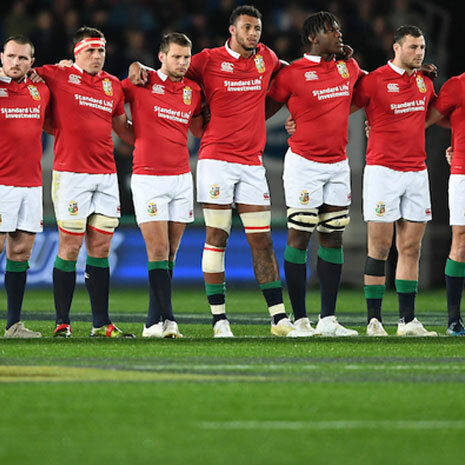 The Red Jersey became the Lions standard in 1950 as they returned to New Zealand as on the previous tour there had been colour clash controversy; the All Blacks, black shirt had deemed the Lions Blue to similar so in came the Red. 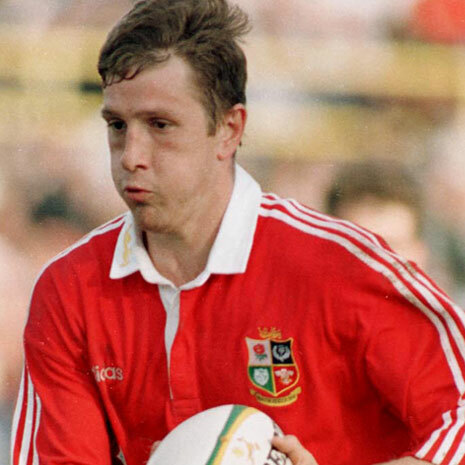 Since 1950 the changes to the notorious kit made up of Red Jersey, White Shorts and Green & Blue Socks have been the in form of stylings, suppliers and of course the inclusion and changes in sponsor. The 2017 shirt is a reimagining of a true classic despite it being Canterbury’s first time as the Lions kit supplier. It maintains Classic features with the wingtip collar inspired by the fashion of 1888 while maintaining newer technical features like Vapodri sweat wicking fabric for the main body and Vaposhield water repellent shoulders and sleeves. Some of the key new items surround the crest itself. 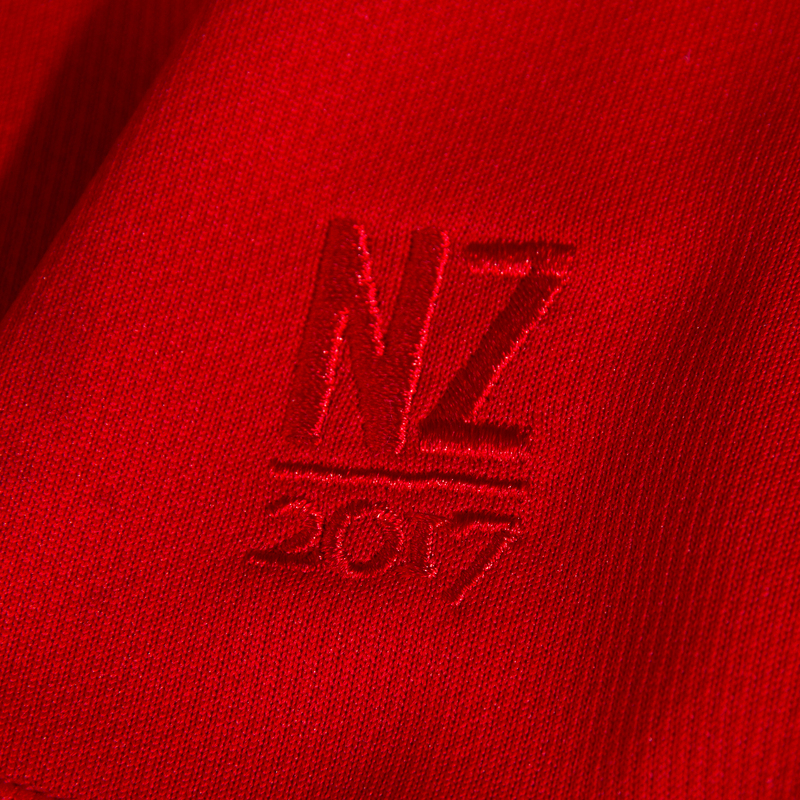 This Tours shirt doesn’t feature the dates under the crest but on the arm of the shirt, replacing it is “Since 1888” reflecting on the teams heritage. The Crest itself is HD quality stitched making it sharper and brighter than its predecessors. 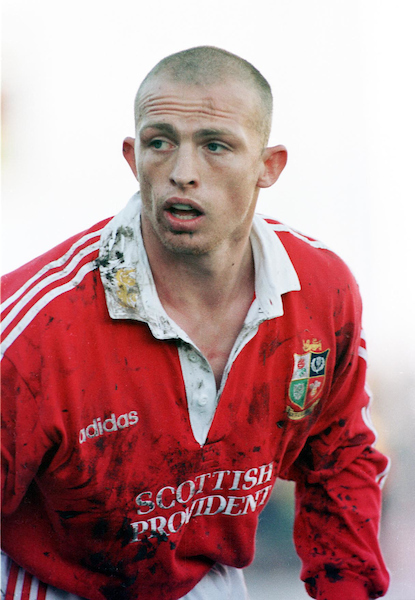 The Untouchable Shirt has a lot to live up to on pitch but its comparison to past kits shows it appreciates the historical significance that the Lions hold and has the hallmarks of being something that can easily join them in the History books.